Purposeful dreaming: Punchdrunk at the Aldeburgh Festival. A single deckchair seems abandoned on a blustery rainy day in Aldeburgh on the Suffolk Coast. Perhaps it has been abandoned by ambitious North Sea sunbather earlier that day. From the nearby watchtower, two figures emerge. One wears a large set of headphones and a transparent mac, which is being battered back and forth by the sea wind. Their companion guides them to the deck chair. It’s up to them whether they sit on the chair. It’s probably quite wet by now. They won’t be there long anyway. Someone’s coming to get them. Another companion, this time unseen. He knows that they are waiting for him. The journey they will be taken on is The Borough, a Punchdrunk production commissioned specifically for this year’s festival. The Borough is also the name of the George Crabbe poem, which contains the story of Peter Grimes, on which Benjamin Britten based his opera of the same name. Britten having been one of the founders of the Aldeburgh Festival and his year being his centenary, the Festival commissioned three versions of the story of Grimes for this year. 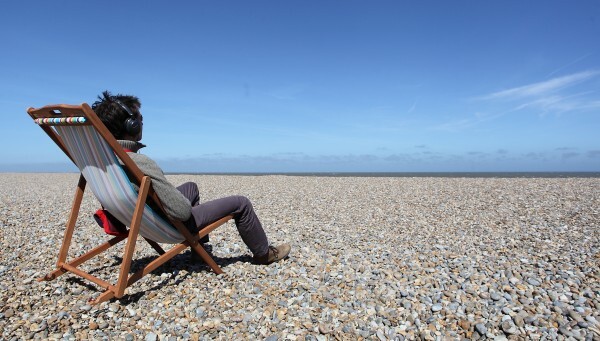 There have been concert performances of the opera at Snape Maltings Hall and an ambitious attempt to stage a full production of it on the beach. In fact, from that lonely deckchair, you can see the set off to your right. My first experience of Punchdrunk was Faust in Wapping in 2006 and what I found so exciting about it was the way I could wander at my own pace, having a totally individual experience. At the time, I was very new to me at that time and felt liberating and transgressive. With The Borough though, it is essential that you remain in the synch with the MP3 you are listening so the pace has essentially been decided for you. I asked Katy about the implications of this shift in control. The gesture of Peter Grimes the opera, as a dramatic work, could be defined as the community turning against Grimes and that is the experience that Punchdrunk wanted the audience to undergo for themselves in The Borough, Katy tells me. What I found most unnerving was not knowing where the boundaries were between the world of the story and the real world. The cast is a combination of professionals and community performers. As it goes on, it becomes hard to differentiate which passers-by are in it and which aren’t. Often they won’t approach you unless you look at them or if you go off course. This induces a particularly paranoid state. Even though the run of The Borough is over, I feel reluctant to reveal its final moment, in which you feel the full force of the community’s move against you. I think perhaps that it’s such an experiential moment that attempting to describe it won’t really do it justice. Instead, I’ll write about what happens right before. The narrator guides you to the edge of the town, to the marshes. Through the high reeds, you can see a path leading to an isolated hut. There is nothing else there. You can look towards the sea and just about make out the tops of boats, you can look towards the town and see the roofs of houses but if you look straight ahead as the narrative compels you to do there is nothing but you, the hut and the path. By this stage, you don’t need the narrator anymore and sure enough he soon tells you: “you’re on your own now”. The isolated cabin, the small community that keeps itself to itself, the cornfields (okay, they’re not cornfields but they don’t look all that different): all classic tropes of US horror movies. Unlike dreams though there is nothing subconscious or accidental about a Punchdrunk show. It is, in this sense, as Jonathan Franzen has described all fiction, “purposeful dreaming”. Katy tells me that there are people who have seen the company’s wildly successful New York production Sleep No More over fifty times. She believes they keep coming back because it’s one place where their search for meaning will constantly be rewarded, where nothing is accidental. Unlike the messy business of real life.